German Technology Coverage: 1. 2 kg powder / m2 / mm thickness. One bag of 40 kg covers approx. 200-220 sft in 2 coats for maximum thickness of 1. 5 mm depending on the surface level. Substrate Quality: The substrate should be free from grease, oil and loosely adhering particles. Substrate Preparation: Clean the surface with the help of emery stone, putty blade or wire brush. Moisten the wall with sufficient quantity of clean water. There should not be any mildew or algae on the surface. 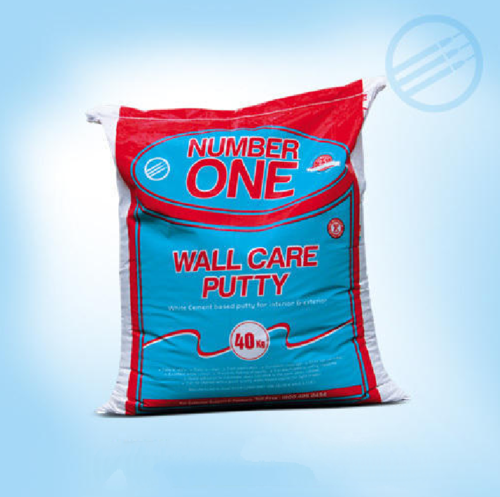 Application Method: First mix the supplied number one wall care putty with recommended water (14 litre), by weight of powder as printed on the packaging. Continue mixing until a homogeneous lump free paste of desired consistency is obtained. Apply 1st coat of number one wall care putty uniformly on already moistened surface with the help od putty blade or trowel. Mix only that quantity which can be applied within workable time. After surface drying of the 1 st coat apply 2nd coat with fresh material. The total thickness of 2 coats should be maximum 1,5mm. Uneven thickness due to unskilled application may cause problem. After complete drying and hardening, the surface should be prepared with fine waterproof emery paper before painting. Finishing should be done by skilled pop applicators. A group of young men under the stewardship of Mr.K.Chandrashekar and associate Mr.S.Ganesan, armed with years of technical experience in design, fabrication and commissioning of welding electrodes manufacturing machinery and systems, as well as welding electrode itself, got together to take the technology to the common man. Eureka Systems was thus formed as a partnership company. Turnkey projects including machinery, technical know-how, and trained workmen were offered to small-scale entrepreneurs. We feel proud to announce that more than 26 such systems are serving the Indian Industry for the last fifteen years, and that our entire plant from wire straightening and cutting to extrusion, baking and packing are designed and fabricated by us. We have approved Vendors with high tech machinery, and skilled workmen to keep up strict delivery schedule. Our manufacturing unit serves us well for day-to-day Production planning, Research and Developed and feedback to update the technology in machine building as well as product specialization. Emboldened by the constant exposure to technical challenges and have ventured into manufacturing welding electrodes. The market hither to used to ?High cost-High profile? products, received Eureka?s electrodes with cheer as it was affordable to common man. From partnership, Eureka systems and electrodes grew into a Private Limited Company in the year 1989. Entrepreneurs with proven talents and stalwarts in their respective fields like paper and textile exports found common ground in contributing a sizable share of the venture capital and became directors. It was the beginning of the real growth of the company. Their unstinted support elevated Mr.K.Chandrashekar as Managing Director and Mr.S.Ganesan as Technical Director. The company moved into its own premises fully equipped with Chemical, Physical and Welding Labs.